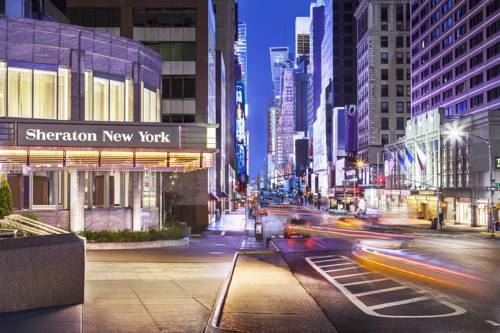 A $180 million renovation has reinvigorated the Sheraton New York Times Square Hotel, between Central Park and Times Square in the Midtown business and entertainment district. Go from a crucial meeting to a famous uptown eatery without missing a beat.Your next event will be a complete success in our newly-renovated meeting space totaling 60,000 square feet. Energize in our 4,000-square-foot state-of-the-art Sheraton Fitness center. Computer workstations, located in the lobby, make it easy to stay productive while traveling.A polished, contemporary flair is evident throughout the hotel. All guest rooms feature the ultra-comfortable pillow-top Sheraton Signature Sleep Experience and a host of thoughtful, innovative touches, including ergonomic desk chairs and extra storage. Be a part of the NYC spirit at the Sheraton New York Times Square Hotel, located on 7th Avenue between 52nd and 53rd Streets in midtown Manhattan. Just steps from the excitement of Broadway theatres, prestige of Carnegie Hall and world-class shopping of Fifth Avenue - our location is the perfect way to immerse yourself in the best that New York has to offer. The Link Caf proudly brews Starbucks coffee in the morning and also offers grab-and-go breakfast options. In the evening, the Library Bar s full bar with a specialty cocktail menu complements menus of entr es and original small plates.